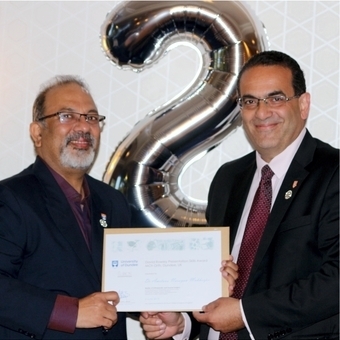 Dr Amitava Mukherjee was presented with the Department of Orthopaedic & Trauma Surgery’s David Rowley Presentation Skills Award from Professor Rami Abboud on 2 June 2018. The prize was awarded during a dinner celebrating the 25th Anniversary of the MCh (Orth) course and is awarded annually to the student who has best presented their research, orally, by PowerPoint, and visually via a scientific research poster. Dr Mukherjee’s research project, “Design development and evaluation of a prototype modular humeral component for shoulder arthroplasty” was supervised by Dr Tim Drew (Senior Lecturer at the TORT Centre). Left: Dr Mukherjee participating in a spinal workshop; Right: Presenting his research work to the board of examiners prior to his Viva. Professor David Rowley, who the award is named after, began his medical studies at Aberdeen University in 1969 and was a lecturer at the University of Sheffield and a senior lecturer at the University of Manchester before taking up a post at Ninewells Hospital and Medical School in 1988 as Professor of the University Department of Orthopaedic and Trauma Surgery until relinquishing his chair and his post at the university in 2008. Professor Rowley was the instigator of the MCh (Orth) Degree at Dundee in 1993 and served as Director of Education for the Royal College of Surgeons of Edinburgh and was also visiting professor of surgical education at the University of Edinburgh from 2004 until 2009. He has gained many distinctions during his career, including the Gold College Medal and Syme’s Medal, both awarded by the Royal College of Surgeons in Edinburgh. He also served abroad as a war surgeon for the International Committee of the Red Cross in the Sudan and Afghanistan. After 40 years Professor Rowley retired from offering clinical advice in 2014.